Anyone can tell you if a trailer "looks good" or not. But Drew Magary, who spent over a decade working in advertising, is here to tell you whether or not a trailer WORKS. This week's trailer? 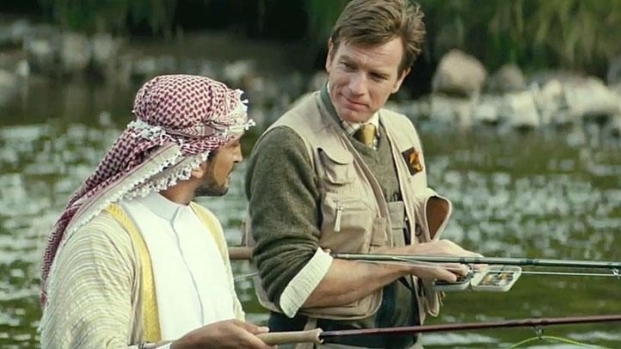 "Salmon Fishing In The Yemen". Does the trailer let us know what the movie's about? Yes. Apparently, some kooky sheik out in the Middle East wants to introduce the "sport" of salmon fishing to his nation, which apparently holds great appeal to Kristin Scott Thomas, some sort of government official person who is looking for a nice story to give the region good PR. Enter McGregor, apparently playing some kind of Irish salmon whisperer, who then explains that you can't go fishing in the middle of a desert. But you and I know that this quirky little movie will prove him wrong, and help him find a little bit of love along the way. Is this a comedy? See, this is where the trailer kind of lost me. At the beginning, it appears to be a sly political comedy. There are clear references to the masterful "In the Loop" here, but then Emily Blunt enters the picture and suddenly the trailer takes a decidedly sentimental turn, with big greeting card cliches thrown up in the titles. Such as? "Sometimes we need guidance." "Sometimes we feel doubt." And the most egregious one of all, a call for "going against the flow." Oh come on, man! The #1 rule of making a movie about salmon is that you do NOT make any tired jokes about swimming upstream. It's just not done. Are we told who's responsible for this movie? We are! It's from the dude who wrote "Slumdog Millionaire" (hopefully there are no eyes spooned out in this movie), and from Lasse Hallstrom, who brought you "Chocolat" and "The Cider House Rules." I hated both of those movies, so that title served as a warning to me. But I'm told other people fancied them, so whatever. When things get tricky in my life, should I talk to my fish? You should. Heed Ewan's advice. Is there a wacky pratfall involving a door? There is. Curse you, doors! Always showing up in my weekly romcom to wreak havoc. Does Emily Blunt cry in this trailer? She does. Why? No clue. I think because she loves Ewan. Or maybe because the salmon died. Or because Meryl Streep picked Anne Hathaway to go to Paris instead of her. No matter. She's crying, and it's all very emotional. Does this trailer work? No. I don't understand what the tone of the movie will be. Very few of the jokes are funny and appear to be extrapolated out of context. And I'm scared off by the idea that this will somehow end up being a movie that uses salmon fishing as some kind of hokey metaphor for chasing your dreams. Also, there is NO smoked salmon in this trailer. A shame, since smoked salmon is delicious.